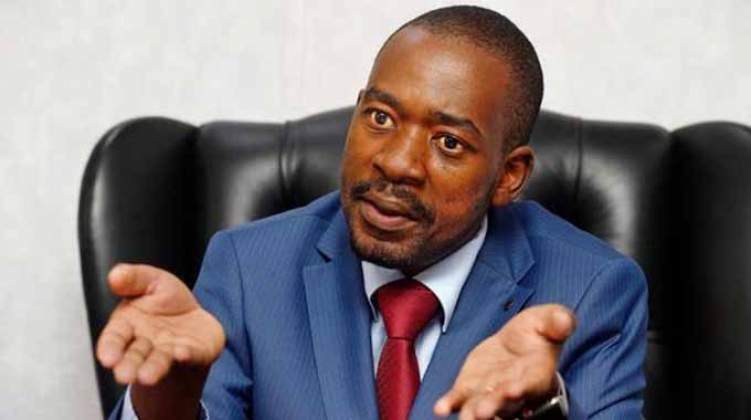 OPPOSITION leader Nelson Chamisa has received an early boost ahead of what could turn out to be a bruising contest when the MDC congress gets underway next month after bagging two nominations from two provinces so far. While many have predicted a tussle of Titanic proportions between Chamisa, his deputy Elias Mudzuri and secretary general Douglas Mwonzora for the position of president, nominations that have come through from the province of United States of America and Matabeleland South show the 41 year old leader running away with it. MDC organising secretary Amos Chibaya told the Daily News yesterday that Matabeleland South Province on Sunday nominated Chamisa for preside, Tendai Biti and Welshman Ncube as his deputies, Thabitha Khumalo (national chairperson) Happymore Chidziva (deputy national chairperson),Tapiwa Mashakada (treasurer general) and Rusty Markham(deputy treasurer general). “All is going on well and peacefully. We hope it will remain like this until we conclude the national congress. Today (yesterday) we are in Matabeleland North with the aim of emulating Mat South so it is all systems go, everything is in place for that province’s congress and nominations,” Chibaya said. Chibaya also said while Mudzuri who was initially seen as a challenger to the post of president, has not yet received any nomination for any position, Mwonzora has since been nominated for the position of secretary general by Matabeleland South. Mwonzora was nominated for the position of secretary general while Settlement Chikwinya was nominated to deputise him. I was also nominated for the position of national organising secretary with Morgen Ncube as deputy while Jacob Mafume and Bekithemba Mpofu were nominated for secretary for information and deputy respectively,” Chibaya added. For the position of youth assembly, Chibaya said the province had nominated Obey Sithole. The nominations come after one of the party’s external provinces of United States of America also nominated Chamisa on Saturday last week. While the province nominated Chamisa for presidency, it opted for youth Assembly secretary general Lovemore Chinoputsa to become youth leader to replace Chidziva who it nominated for position of deputy national chairperson. The US province also nominated Morgan Komichi, Welshman Ncube and Lilian Timveos for positions of vice president. Mwonzora, Mudzuri and Biti were all omitted from the USA list that included Charlton Hwende (Secretary General), David Coltart (Treasurer) and Mafume (Spokesperson) among others. With provincial congresses still ongoing , it is increasingly looking like there will not be any elections to write home about with Chamisa’s allies taking almost all on offer during the provincial congresses. For example, while other positions are still up for grabs in Harare Province, Glen Norah MP Wellington Chikombo has since been elected provincial chairperson unopposed are getting 29 nominations from 28 districts for the influential chairperson’s position. “We are done with Harare in terms of nominations for chairperson and I have been nominated by all the districts meaning there will not be an election. We still however have other positions to be contested where more than two people got nominations we will only sit down to nominate candidates for national positions when my entire executive is fully constituted,” Chikombo told the Daily News yesterday. This comes as some members are accusing Chamisa of manipulating the structures in his favour and making it hard for his challengers to come out and openly campaign ahead of the congress. Chamisa’s challengers also accuse his lieutenants of tampering with structures and indirectly making it difficult for those reportedly outside his camp to freely open up and prepare for the elective congress. Chamisa is seeking to retain the post he took through a national council resolution following the death of Tsvangirai-a development that sparked uproar from Mudzuri and his sympathisers who felt he was entitled to take over instead.